Rush Express is a courier/messenger & Taxi Truck company serving the region with same day, overnight freight and airport pickup and deliveries. Rush Express prides itself on handling all orders in a professional manner with time sensitivity. Rush Express offers PODs without charge and overnight delivery guaranteed by 5.00pm the following day. Discover why Rush Express Couriers is Sydney’s Area’s premier Courier, Messenger & Delivery service at competitive prices. Call us today on 1300 787 448! …to achieve success and fulfil our responsibility to our customers, employees, and the general public, through traditional values. …endeavour to earn customer confidence by helpful, proactive, professional excellence in service. We will strive to protect the interest of the general public as we employ trained, experienced, safety conscious Rush Express team members. 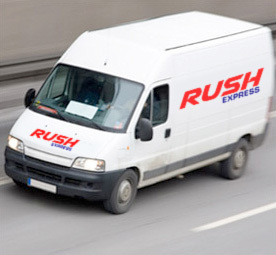 The name Rush Express is synonymous with quality courier service, punctuality and compliance to customer needs. We provide a 24-hour courier service from Monday to Sunday for account holders. We are available on call on weekends, (for Rush Express account holders only – Pre bookings only) which means that we work whenever there is a courier service demanded by a client. Well-regarded for our courier and Taxi Truck services, we are equally popular for our services associated with warehousing in Sydney. 3pl Warehouse logistics at our end refers to the shipping of inventories from place to place, storage of inventories by making use of wooden pallets and handling of materials. The storage and distribution (3PL) is done by us on behalf of the clients. Rush Express is a trusted courier and Taxi Trucks service provider in Sydney that is known for providing high customer satisfaction levels. We operate in Sydney as well as in and around New South Wales. Our Taxi Truck services are available round the clock from Monday to Friday – but if the need arises we will extend services in Sydney on weekends as well. Rush Express is a premier Logistics Service Provider in Sydney. Offering a variety of handy services Monday to Friday – and beyond if required. Rush Express is a trusted Taxi Truck service provider in Sydney that is known for providing Great Vehicles from a 1 Ton ute through to a Semi Trailer for high customer satisfaction levels. Well-regarded for our courier and Taxi Truck services, we are equally popular for our services associated with 3pl warehousing in Sydney. Rush Express offers a same day book by 10am pallet rate service for delivery by 5.30pm or book after 10am for a pick up the following day. Rush also offer a Priority Pallet rate service for bookings made after 10am. This service is plus 50% of the standard pallet rate. – same day rates are subject to the pallet size. Clients, who do not have additional space to stock up inventory, can utilize the Rush Express storage and distribution service to meet their warehousing and logistic requirements. With everything being real-time, Rush Express has the potential to provide our Clientele, Management and staff with improved decision making.